One last hurrah for all the friends, family, friends-of-family and friends-who-are-family who have October birthdays and, being mostly social-butterfly Libras, are adept at keeping the celebration going an entire month. 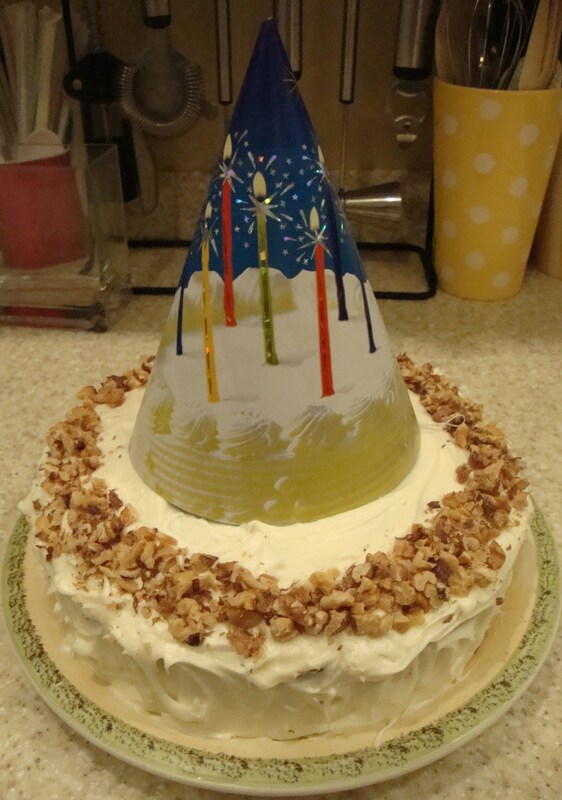 Wrapped it up with a carrot cake for one of the above who was celebrating a big-number birthday this year. Tried a new recipe that was flavorful, but next time might return to Gigi’s Carrot Cake, a particularly moist cake that’s close to my heart, since it was part of the Emeril Live! episode (back when that was a hit on the Food Network) where a couple of us got picked from the audience to sit at the counter, sample the desserts being made, drink endless glasses of wine and get a bit of camera time. (Our group’s overachiever efforts to wow the warm-up producers with loud chants of “Bam!” and “Bacon Fat Rules!” worked.) It may not be as healthy a recipe as the just-made version, which substitutes yogurt and oil for copious amounts of butter. But lighten up kids, we’re talking birthday cake! Happy Birthday to Meeeee!!!! It was a beautiful cake to look at, but more enjoyable in my tummy.